My home is on Hong Kong Island, though Hong Kong SAR is actually comprised of many bits of land. 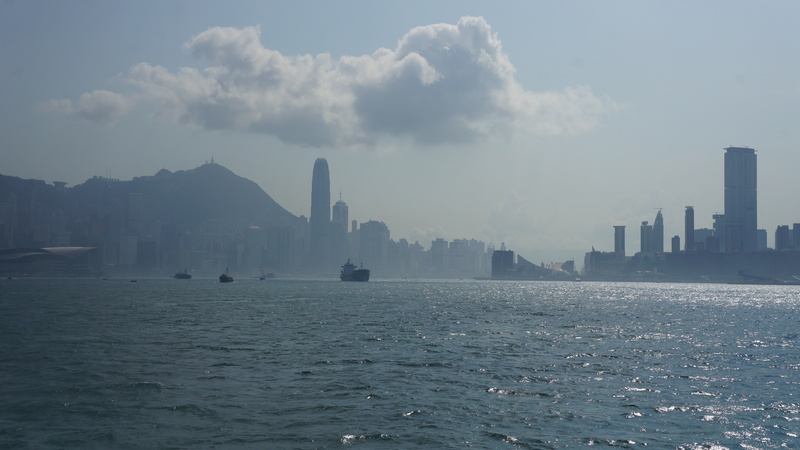 HK island, Lantau, Lamma, Cheung Chau, Po Tai, are just some of the islands, while Kowloon and the New Territories are actually connected by land to Mainland China. I tend to spend most of my time on this island, and mostly on the north side. Consequently, I go weeks at a time in the same 2 mile strip of land on the northern shore. Fortunately for me, I have friends in other areas of town. Sometimes that means I get to go to Lantau and hang out on the beach and climb a mountain; sometimes that means I go for a hike; sometimes it means I meet someone for dinner. Sunday night found me going to Hung Hom for the first time. I got to take the North Point Ferry for the first time, and cross the harbor in about 5 minutes. 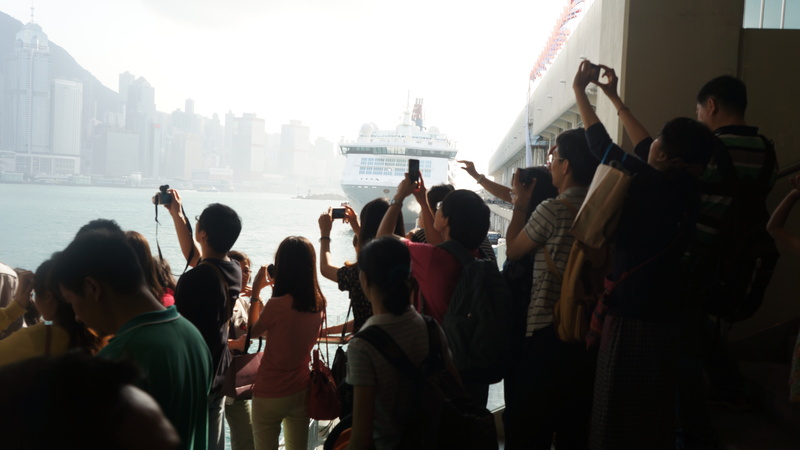 It’s an open air boat which gives you the best view of Hong Kong from any ferry. Refreshing and mostly empty, it only runs every 30 minutes, and hasn’t a tourist in sight. It also showed me a perspective of Hong Kong I hadn’t seen yet, or hadn’t seen in a while at least: straight down the harbor towards Central and Kowloon. Upon docking, I discovered the glorious promenade. The Hung Hom promenade connects to the TST promenade in the west (it’s 1.5 miles to the TST ferry pier), and has spectacular views of HK island. In fact, you can see the entire thing. All of the areas I spend most of my time in contained in a single glance. While this was slightly stunning, I met up with my friend and she showed me around Hung Hom proper. 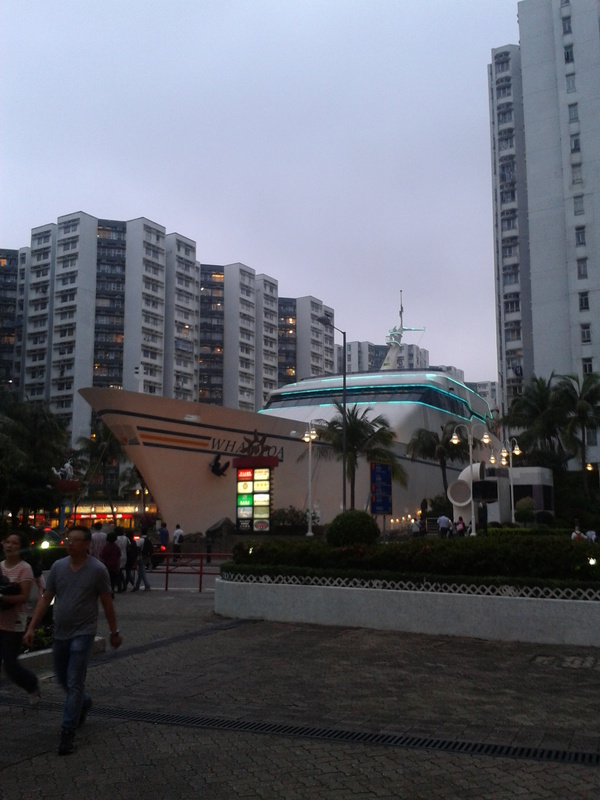 We went to Whampoa: a neighborhood within Hung Hom that is a large outdoor shopping mall (and indoor) that includes a full sized cruise-ship-shaped shopping center/food court/gym. Perhaps it’s too much? Doesn’t really matter, because this place has all the shops and all the restaurants. We went to a place called ‘Wing Lai Wen’, which is purported to have the best Dan Dan Mien (spicy noodles) in Hong Kong. There was a bit of a line, but because there were only two of us, we were seated immediately (benefits of going with small groups!) and ordered in our best Cantonese combined with pointing (her Canto is excellent, mine extends to asking for a bill). It is a Szechuan restaurant, so it supposed to be full of chili, and some was, but we had to ask for more spice on our noodles (not the best in HK). Maybe I look too foreign? Either way, if you don’t like spicy food, you can still go here! Delicious and inexpensive, even if it’s not spicy. There are also a billion other restaurants to go to. We might try them all. So on a Sunday night, there is only so much you can do. I went home on a bus that took me directly to my flat in 15 minutes. Amazing. So easy. I sometimes forget how simple it is to go somewhere new. Flash forward to Monday, I decided to go back and see what else I can find. I took the ferry again and walked from Hung Hom to TST. I went from mostly peaceful and quiet and beautiful in Hung Hom, to Crowded and noisy and touristy in TST. I had to first walk through the ‘Avenue of Stars’ which was full of Chinese tourists huddling in shade or under umbrellas and strolled by the bronze statue of Bruce Lee. The crowds got even denser. By the time I got to TST proper, there were dense groups milling about, mostly because of the giant rubber duck. 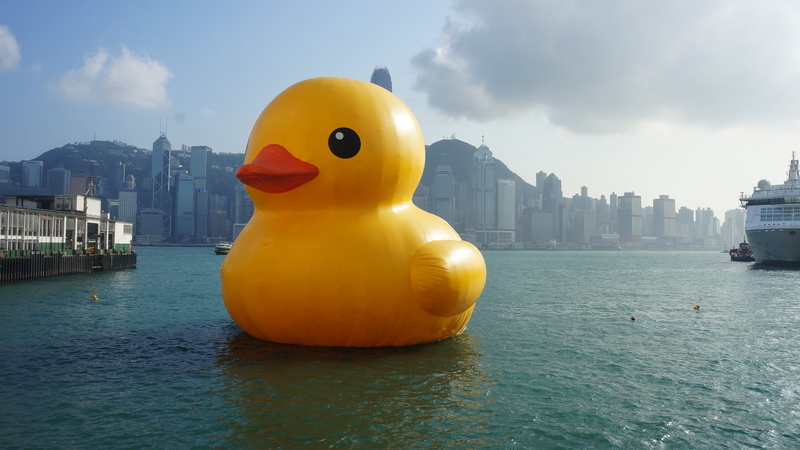 Apparently the duck (which is a few times larger than my apartment) traveled to Hong Kong from Australia on the open ocean. Why? I do not know. But there it is. And with all the hype about the duck that’s been going on in this country, I too felt compelled to go and see it. Yippee. So there’s the duck. Going back to other parts of Hong Kong is always nice; it refreshes my view of the place where I live. The entirety of the location is so small that the physical distance of the harbor allowed me to see it all at once. The juxtaposition of looking at my sphere of existence and also a massive duck is somewhat surreal, possibly suggesting I need to relax a little and be less serious. The strangeness of a cruise themed neighborhood and a massive floating duck really underline how odd and hilarious Hong Kong can be. Don’t you just love the North Point Ferry?!! I agree, its awesome, scenic and less touristy 🙂 Its so cool discovering those bits of HK which don’t at first glance seem obvious!